Port Authority Police responded to a Greyhound Bus after accident at West 40th Street and Dyer Avenue. NEW YORK CITY — At least three Port Authority officers made more than $300,000 each last year thanks to overtime pay that tripled their salaries, DNAinfo New York has learned. In fact, one $300,000-plus officer made so much overtime that he had to have worked more extra eight-hour shifts than there are days in the year, Port Authority records provided to DNAinfo New York's “On the Inside” show. That officer, Andrew Kurpat, a 25-year veteran working at the World Trade Center, made $316,213 last year, more than triple his $90,000 base salary, thanks largely to $200,233 in overtime. Based on his overtime rate of $64.89 an hour, which is 1.5 times his regular hourly pay, Karput worked 3,085 overtime hours — an amount that's the equivalent of 385 extra eight-hour shifts. “It is a helluva lot of overtime, no question, but it happens when everyone else passes on taking it and where someone is willing,” a union official said. Union officials blame the Port Authority for not hiring enough officers to protect the agency's high-profile facilities, and then find themselves literally forcing overtime on their officers to cover bustling airports and transportation hubs when a terror threat occurs here, or overseas. Karpat, meanwhile, even with his overtime windfall, was not the top Port Authority police earner last year. The other member of the $300,000 club was Officer Elvin Erickson, who raked in $311,213 last year — more than triple his $90,000 base salary — thanks primarily to $170,000 in overtime. In addition to the trio who cracked the $300,000 ceiling, 11 more officers made between $250,000 and $300,000, and nine others raked in between $234,000 and $250,000. By comparison, Port Authority Chairman Patrick Foye made $289,667 last year. Michael Fedorko, superintendent of the 2,000-member Port Authority police force, makes $215,098, and NYPD Commissioner James O’Neill is paid $215,306. DNAinfo reviewed the most current publicly available Port Authority salary records that covered Jan. 1 through Oct. 31, 2016, and then requested additional information about the top 22 officers who racked up more than $110,000 in overtime. The Port Authority then provided the complete 2016 salary data for those officers to DNAinfo. Updated information for the entire force covering all of 2016 will not be available publicly for at least a month. Meanwhile, eight of the high-earning officers are veterans with at least 20 years on the force, which makes them eligible to retire with pensions that are least 50 percent of their highest 36 consecutive months' salary — guaranteeing them at least $150,000 or more annually for the rest of their lives. 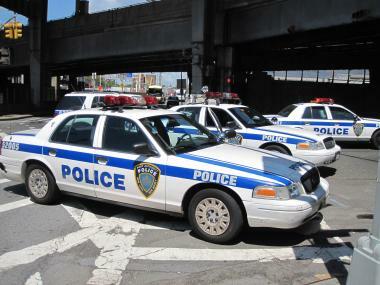 A Port Authority police spokesman Joseph Pentangelo said the agency "has been working diligently to reduce overtime" and is "focused on ensuring efficient use of staff hours." Overtime, he said, accounts for about 17 percent of the agency’s labor costs reflecting "heightened security costs, training and demand" due to "global terrorism events" that require manpower surges to "protect the traveling public." But Paul Nunziato, the Port Authority Police Benevolent Association, countered that the problem is habitual understaffing based on the PA’s belief that it is cheaper to pay overtime than to hire more officers with their additional health and pension benefit costs. “The Port Authority has been an epic failure in providing proper police manpower in the post-9/11 world protecting the highest profile targets in the nation,” Nunziato said, pointing out how the authority has to handle sudden "terror" coverage with overtime. At the WTC, PATH trains and the three metropolitan area airports alone, the PA "forced" officers to work more than 40,000 hours of overtime last year when they ran out of volunteers, Egbert said. “The Port Authority always plans for a sunny day, but every day at Port Authority facilities, it is raining,” Nunziato said. DNAinfo reported three years ago that eight PA officers broke the $300,000 ceiling thanks to overtime that more than tripled their base pay, with a total of 11 making more than the chairmen who jointly ran the bi-state agency that year. Under union rules, overtime is handed out only to those willing to accept it, and heavy overtime earners only receive more overtime when others decline to take it. If no officer is willing to work an extra shift, the Port Authority has the power to “force” someone to remain on duty, officials said. The Port Authority Police Department graduated a class of roughly 100 recruits in December 2016, and is in the process of training a new class, which "should help lessen the need for additional overtime going forward," the agency spokesman added.